SELLING YOUR STUFF IS COMPARABLE TO RUNNING A BUSINESS- EITHER YOU WANT TO MAKE MONEY OR YOU DON’T. Local garage sales for 2017 are slowly popping up as Spring has finally arrived but you’ll find the end of May into June, July and August the biggest garage sale months of the year. Typically garage sales kick-off on the Victoria Day long weekend at the end of May when most people poke their heads out from inside closed doors. It’s as if it’s safe to come outside. For those eager sale seekers there are people who host a garage sale as soon as the birds start chirping at the end of March. Spring cleaning is in full-swing with windows opened to let the fresh air circulate through the musty wintered house. This is also the time homeowners and renters realize they have far too much stuff. Mrs. CBB and I decided that this summer we were going to hold our first CBB garage sale and get rid of stuff once and for all. I’m a firm believer that any time I’m out to make/save money that I treat whatever I’m doing like it’s a business. A garage sale is a big business and if you’re not prepared with the right garage sale tools you may lose the customers that have the money to spend. The last thing you want to do is haul all of your useless stuff back in at the end of the day. Having the right Garage Sale Tools. At the dinner table a few days back we talked about what garage sale tools we would need in order to host a successful garage sale. Both of us are planners so this is where the need to know comes in before we jump into cold water. In essence hosting a garage sale is about hustling customers and trying to get the best prices for stuff you have no use for where they eye as gold. Start going through all of your stuff and set aside what you no longer want. Our biggest downfall after buying our first home in 2009 was that it was empty so we went a bit wild filling it up. Almost everything we own is second-hand apart from technology based items that we prefer to buy new. Buying used was in part a savings mechanism we used to help us pay our mortgage off in 5 years. We even made purchases for our unfinished basement which will probably stay that way for another couple of years. That’s a long time to be holding on to furniture and home decor. The worst is having to dust something you aren’t even using but want to use. It’s easy to keep buying but it’s harder to let stuff go until it becomes an overwhelming clutter of stuff you forgot you owned. That’s when you know it’s time to de-clutter and organize a garage sale. If you do post your garage sale online it helps if you have garage sale pictures of some of the big-ticket items you are selling. Photography is another wonderful marketing tool that garage sale hosts don’t want to miss out on using to their advantage. An attractive sign that is easy to read always intrigues people, especially if there will be free stuff. I wouldn’t suggest Free Beer as in the photo above but I’m sure it got the attention of many. Mission accomplished. You’re welcoming strangers onto your property and for some into their garage and home (furniture/TV/computer etc.). Always lock your front and back doors because no one will take much notice if someone is walking inside or to the back of the house if a garage sale is in progress. Even if you are in the garage lock that door as well unless there is someone inside. It’s easy for a stranger to slip in without notice with back-up watching your every move while guiding the burglar on a cell phone. Keep pathways clear and put up signs if you want people to take their shoes off, avoid smoking or feeding the pets (or your kids) if you have any outside. Organizing a garage sale isn’t something you should attempt to do the morning of the sale or even the night before. Planing a successful garage sale takes time and the right garage sale tools to help get rid of your stuff. What time is it? I don’t know. Get rid of the clocks if you have any in the garage. You don’t want to rush your buyers away because as the clock is ticking they know the good stuff won’t last long at other garage sales. Well-seasoned garage sale ninjas are on the hunt and they move fast. These are the people who get in and get out and look as if they’ve had way too many coffees for 7am garage sales on a Saturday morning. Some buyers arrive on a cruise ship and others use a speed boat. Learn to tell the difference by watching your customers. Odds are you won’t make much money from them because they know what they want and they have eagle eyes and can swallow everything you have in seconds. If they spot something they will do whatever it takes to get it for the least amount possible. Related: Should you negotiate prices at a garage sale? Many of these types of garage sale warriors will re-sell the stuff they buy for profit so they already know what they are willing to pay. If they don’t manage to dig the garage sale owner into the ground for the price they want, they’ll walk away and send someone else to try. Ha! Not always but it happens. The same thing happens on Kijiji. If the seller doesn’t budge on price get your mother, father, brother or sister to send a message to the seller and see what they can get the price down to. My goodness anyone who hasn’t held a garage sale before or hasn’t been to garage sales might have the shock of their lives when it comes time to host their first garage sale. It can be overwhelming for the sellers especially if they have sentimental attachment to items and buyers are trying to scoop them up for bread crumbs. You have to be ready for business and ready for just about every kind of customer to come your way. 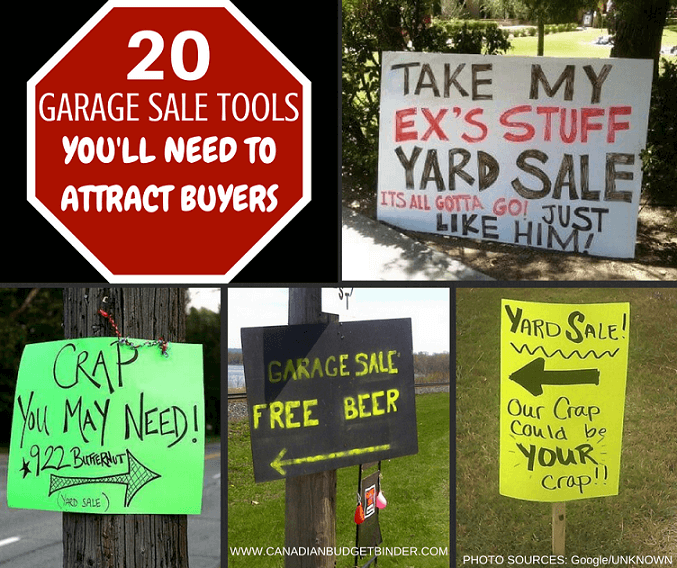 Related: Garage sale secrets to sell your stuff fast! In order to deal with your customers you must make sure that everything else is under control and organized with your garage sale. This is why it’s so important to gather all the garage sale tools that you will need BEFORE the sale. I’m talking even a week or two before to make sure that you’re ready. Sometimes it’s the small stuff that adds up to big disasters. You don’t want to miss a sale either because you don’t have your garage sale tools in place and ready to go. The most appealing garage sales are those that are neat, tidy and organized. I think those three words all mean the same thing. In other-words, buyers don’t want to dig through mounds of old clothes laying on a tarp on your front lawn. I also find I’m attracted more to sellers who are friendly, welcoming and smiling. I think all of those 3 words all mean the same thing too. Be happy. No one is going to come and talk to you if you’re grumpy and for goodness sake eat your breakfast before the garage sale. I can’t stand it when homeowners are outside with a bowl of cereal and trying to sell stuff. How would you like it if you went into Tim Hortons for a coffee and your cashier was finishing up a donut and trying to serve you at the same time? One of the best garage sale tools you can have is yourself. If you aren’t in the ‘mood’ to host one then don’t. You can wait until you’re in a better selling mood and then watch the sales come pouring in. Another pet peeve is when a garage sale is not ready when they say it will be ready. Prep work is essential and doing it the morning of is the biggest waste of time especially when the crowds streaming and looking for prices on items. No one likes to wait just to know a price but they will wait to negotiate the right price. Keep your pets indoors or under control so they aren’t disturbing your customers and if your kids are playing with the stuff you are selling odds are no one will buy it. On any given Saturday during the high-season for garage sales there will be so many garage sale listing that if you’re not on top of things buyers will pass you by. That means lost revenue for your business wallet. Excellent customer service skills also means knowing when to sever ties with a buyer that isn’t making a purchase. As friendly as you should be don’t waste too much time on one customer by talking to them about stuff that is irrelevant to your job- selling your stuff. You’re not there to make friends, you’re there to make money but it doesn’t hurt to swap numbers or catch up at a later date. Successful garage sale pricing 2017 depends on how much you paid, what it’s worth to you and to someone else. If you over-price it won’t sell if you under-price you lose. Knowing current trends, prices, the shape your item is in and being able to read your buyer all attributes to a sale. Please whatever you do, DON’T use Amazon Canada as an online garage sale pricing source. The numbers are skewed on many third-party products so you really need to know your prices before becoming an Amazon shopping pro. Garage sale clothes rack. If the clothes are on racks, neat and on hangers with price tags. You can also divide the clothes into Men’s, Ladies, Babies, Boys and Girls and by size. The easier you make the process the faster you will sell it. Garage sale tables to place your items on so buyers don’t have to reach on to the ground for everything. Bristol Board/Markers/Tape to make unique signs for everything. Try to be funny and inviting when marketing your signage. Table and chairs or desk for the sellers stuff. This also acts as a payment area so the buyer doesn’t have to hunt the homeowner down to pay them. Calculator to make sure you’ve got the right numbers. Cold drinks for sale, Snacks for sale. Colour coded stickers from the Dollar Store- Make a sign with the prices and coding colours that the stickers represent or attach a sticker to each item and use a marker to price the item. Telephone just in case a buyer needs to call a life-line such as the wife, husband, boyfriend/girlfriend to see if it’s OK to buy something or to ask questions. Who knows you might even need to call the police or 911 if there is an emergency. Measuring tape, screwdriver and hammer is needed but only if you have items that might need taking apart or measured. Garbage can for the buyers that have empty coffee cups and whatever else that might need a garbage. Internet nearby to look something up if needed to make a sale. Plastic bags or empty boxes to encourage buyers to load up on stuff. Caution tape to divide the space inside the garage so certain garage items don’t go missing. It’s also like a barrier for buyers that says, ‘Stop’. 20. As a garage sale host it’s important to be seen so wear something goofy that says you’re the homeowner and get out there and sell. Don’t sit on your lawn-chair sipping coffee and chatting while sales are walking away. Discussion Questions: What other garage sale tools would be handy to have ready for a sale?